A quick start offensively for the softball team was quickly surpassed, as the Southern Illinois Salukis throttled the Braves 11-3. Bradley freshman Kaycee Miller created the offensive explosion in the top of the first inning, after leadoff hitter junior Julie Sherman and freshman Alex Chandler both singled during the first two at bats of the game. Followed by two quick outs, Miller hit a home run drove in three runs. Miller’s blast also bounced Salukis’ starting pitcher Danielle Glosson, but Alex Peters came in and started to settle in quickly. 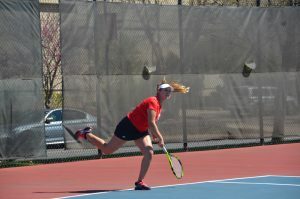 The Braves were unable to hold the lead for the rest of the game, as the Salukis struck back while the Braves’ bats went silent. The conference-leading team in hits quickly struck back. The Salukis blasted their own three-run home run in the bottom of the first. Bradley junior Lindsey Hufeld struck out the first two batters then SIU’s Haley Gorman reached base on an error. Cristina Trapani drew a walk and the table was set for Taylor Osburn’s game-tying three-run home run. From there on out, the Braves did not drive in any more runs as Peters pitched strong five innings and gave up only five hits. After SIU’s Morgan Barchan drove in a run in the bottom of the second inning, another batter scored on a wild pitch by Hufeld. Hufeld’s erratic pitching led to her being pulled in the fourth inning with the Braves behind 5-3. When sophomore Mackenzie Camp came in to pitch, the Braves looked to stop the bleeding, but the Salukis scored two more runs in the fourth, blowing the game open. The Braves were held scoreless for the last six innings. 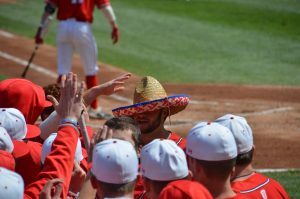 The weekend series saw Bradley outscored by the Salukis 23-4. With the loss, the Braves have lost five straight while going 1-15 in the Missouri Valley Conference. Their overall record drops to 8-31 on the season.